The National Geographic Society is a stately American icon, and a hugely successful media company, but in John Buckley’s new novel The Geography Lesson, it wasn’t always so. 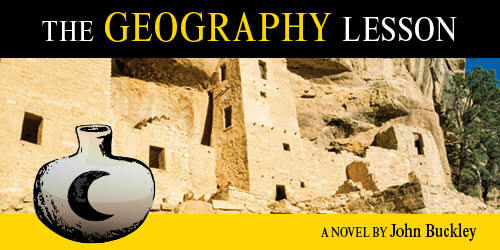 The Geography Lesson tells the gripping story of a botched 1968 expedition in which a National Geographic writer and photographer discover a magnificent Anasazi ruin in Southern Utah. Yet between the moment they make their discovery and their return some weeks later with U.S. government officials, the site is ransacked, and all its most valuable artifacts looted, creating a Washington kerfuffle that brings shame on the National Geographic Society. Nearly 40 years later, as The Geography Lesson begins, retired National Geographic writer Tim Prescott spies the distinctive vase he last saw in that ruin in Utah that he and photographer Wesley Channing discovered, but failed to protect. In a development that will have fatal consequences, he spies the vase in the pages of a magazine photo spread on the luxury condo owned by a certain hedge fund millionaire. From the moment Prescott sees that vase, in that particular apartment, owned by that particular young millionaire, he knows exactly who betrayed him, and who it was that embroiled the National Geographic Society, and Prescott himself, in scandal, all those years before. In his first new novel in more than 20 years, bestselling author John Buckley returns with a tale that is by turns an adventure story, a love letter by an elderly man to his recently deceased wife, and a deeply funny exploration of the National Geographic Society, one of the last Washington institutions to be so revealed by a novelist as knowing as Buckley. The Geography Lesson builds to a thrilling conclusion as Tim Prescott and Wes Channing return, one more time, to work for National Geographic, and to confront what happened in an obscure canyon out West, all those years ago.